On Thursday, January 20, our client, Melon Acres, Inc. was awarded a feasibility study grant for a renewable energy project. We would like to congratulate Melon Acres and wish them the best of luck with their proposed project. Melon Acres' project to be studied is a small-sized butanol production facility that will create fuel for farm-use only from residue melon crops grown by the farm. Melon Acres is an example of one of Prosperity's clients with a unique project eligible for funding! On Tuesday, January 11, 2011, my 2011 Richard G. Lugar Excellence in Public Service Series group and I lunched with Lt. 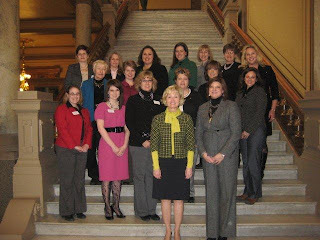 Governor Becky Skillman as part of our January session. Rural development issues are always top of the Lt. Governor's mind, and we discussed a few during this small roundtable. This week kicked off for Prosperity Ag by attending the January meeting of the Indiana Biomass Working Group meeting in West Lafayette, Indiana. Along with White technologies and Poet, I was a speaker and panelist. We covered grant and lending programs for biomass projects. Thanks to those who attended. Happy New Year-and what a cliche' that is! Still, I do feel happy about welcoming this new year-do you? The name of our business is Prosperity, after all, and that is the desire we have for our clients, projects we hope positively impact and our own lives. Please check back often and subscribe for updates and quick posts and longer articles.